A Tension Leg Platform (TLP) is a buoyant platform held in place by a mooring system. The TLP's are similar to conventional fixed platforms except that the platform is maintained on location through the use of moorings held in tension by the buoyancy of the hull. 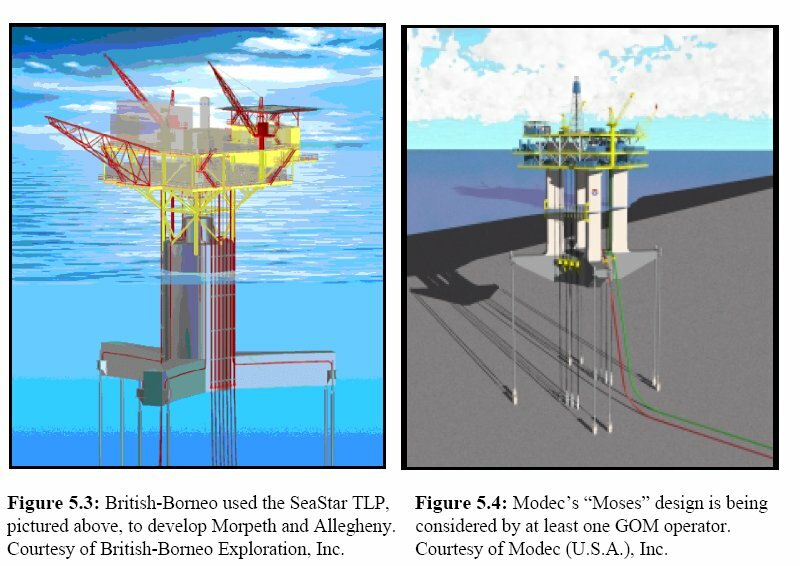 The mooring system is a set of tension legs or tendons attached to the platform and connected to a template or foundation on the seafloor. The template is held in place by piles driven into the seafloor. This method dampens the vertical motions of the platform, but allows for horizontal movements. The topside facilities (processing facilities, pipelines, and surface trees) of the TLP and most of the daily operations are the same as for a conventional platform. The foundation is the link between the seafloor and the TLP. Most foundations are templates laid on the seafloor, then secured by concrete or steel piles driven into the seafloor by use of a hydraulic hammer, but other designs can be used such as a gravity foundation. The foundations are built onshore and towed to the site. As many as 16 concrete piles with dimensions of 100 ft in diameter and 400 ft long are used (one for each tendon). The hull is a buoyant structure that supports the deck section of the platform and its drilling and production equipment. A typical hull has four air-filled columns supported by pontoons, similar to a semisubmersible drilling vessel. The deck for the surface facilities rests on the hull. The buoyancy of the hull exceeds the weight of the platform, requiring taut moorings or "tension legs" to secure the structure to the seafloor. The columns in the hull range up to 100 ft in diameter and up to 360 ft in height; the overall hull measurements will depend on the size of the columns and the size of the platform. 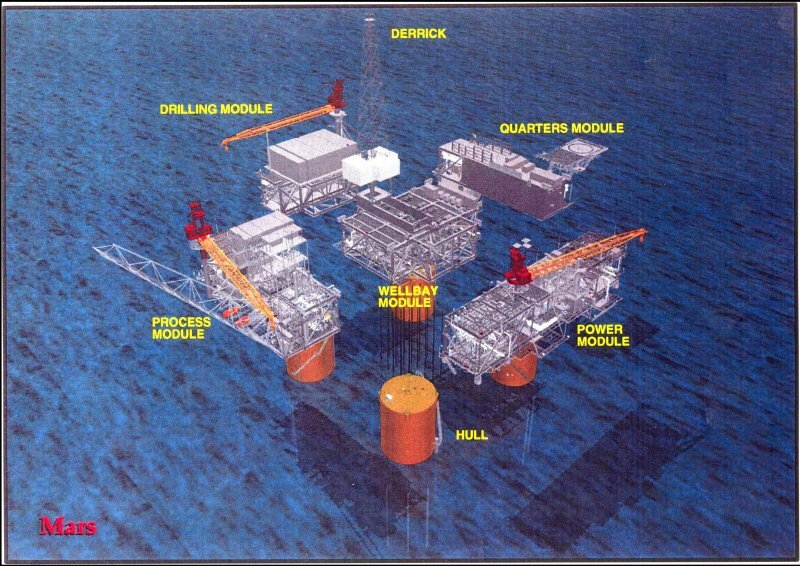 Modules are units that make up the surface facilities on the deck section of the platform. Early in TLP development, industry discovered that it is cost effective to build the surface facility in separate units (modules), assemble them at shallow inshore location, and then tow them to the site. The modules that are part of a typical TLP include the wellbay, power, process, quarters, and drilling; they are secured to the deck, which is attached to the hull. The typical surface facility will be 65,000 sq ft. The living quarters house up to 100 people, depending on the type and scope of activity being performed. Process capacity ranges up to 150,000 BPD oil and 400 MMscfd gas. 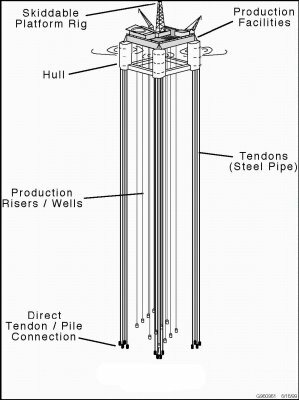 A typical drilling rig located on a larger TLP would have a 1.5 million-pound pull derrick, a 2,000-hp top-drive derrick, and three 2,200-hp pumps. A template provides a frame on the seafloor in which to insert either conductors or piles. Not all TLP's use templates; if used, they are typically the first equipment installed at the site. There are several types of templates that may be used in conjunction with a TLP to support drilling, foundation integrity, or the integration of the two. Drilling templates provide a guide for locating and drilling wells; they may also be a base for the tie-in of flowlines from satellite wells or for export pipelines and their risers. Foundation templates may be one single piece or separate pieces for each corner. The foundation piles are driven through the foundation template. An integrated template is a single piece that contains all drilling support, anchors the tendons, and locates and guides the foundation piles. Separate templates allow each part to be installed individually. They also use smaller pieces that weigh less and are easier to install. The drilling template can be installed and drilling can begin while the foundation template is being designed and built. Tension Legs (tendons) are tubulars that secure the hull to the foundation; this is the mooring system for the TLP. Tendons are typically steel tubes with dimensions of 2-3 ft in diameter with up to 3 inches of wall thickness, the length depending on water depth. A typical TLP would be installed with as many as 16 tendons. A production riser conveys produced fluids from the well to the TLP surface production facilities. An example riser system for a TLP could be either a single-bore or dual-bore (concentric pipe) arrangement. The dual-bore riser would consist of a 21-inch, low pressure (e.g., 3,000 psi) marine riser that serves as an environmental barrier, and an 11 ¾-inch inner pipe (casing) that is rated for high pressures (e.g., 10,000 psi). Installation of a TLP is done in stages; often the design work on one section of the TLP is being done while another part is being installed. For example, the wells will often be predrilled while the TLP is being designed and constructed. Templates provide the layout for well locations and/or for the foundation, if needed. The wells may be drilled to their total depth, or partially drilled and the conductor casing set. Additional well drilling and completion operations can be done from the TLP. Template installation for drilling and foundation templates is similar, except some of the equipment used may be different. The template is built onshore and towed to location for installation. 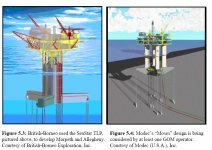 A drilling rig (mobile offshore drilling unit [MODU]) is preferred for installation because it eliminates the need for additional vessels. However, drilling rigs cannot lift large payloads and have limited lowering capacity. Large templates may need a crane for installation; they will also require costly handling systems and rigging. Foundations secure the TLP to the seafloor by use of buried piles, which can be concrete or steel. Tendons are attached to the foundation and the platform is attached to the tendons. The piles can either be driven or drilled and grouted. Driven piles are expensive to install, but the holding power of drilled and grouted piles may not be as strong because of changes to the sole-pile interface during the jetting and drilling operations. A typical vessel used for foundation installation would be one of the several available semisubmersible construction/crane vessels. A hydraulic hammer is used to drive the piles into the seafloor. Pipelines for the TLP are the same as pipelines used for conventional platforms. A steel catenary riser may be used to connect the subsea pipeline to the TLP. Various methods of installation can be used. The most common method used for installing pipelines is the J-lay method. Pipelines for TLP's range in size up to 18 inches in diameter for oil and approximately 14 inches for gas. Often the pipeline will join another system for transport to shore. Oil can be transported by tanker as an alternative to pipelines. The TLP's use tendons to secure the platform to the foundations. There is no set order for installation of the platform and tendons. In some cases the tendons will be connected to the foundations, and then the platform will be moved into place and the tendons secured to the platform. Other operations will move the platform in place first, secure the tendons to the platform, and then attach the tendons to the foundation. Another option is to secure some of the tendons to the foundations, move the platform in place, attach the secured tendons, and attach the remaining tendons to the TLP and then to the foundation. The upper section of a TLP consists of the hull, the deck, and the surface facilities. The surface facility modules are built onshore and typically assembled at a shallow-water location near shore, then towed to the site. The modules may be attached to the hull either inshore or at the site. Economics are the determining factor for where the modules and hull are assembled. The hull provides the buoyancy for the TLP to float in the water and supports the platform. The hull contains several of the mechanical systems needed for platform operation. Topsides-related equipment includes firewater, seawater, diesel storage, low toxic oil storage, and completion fluid storage systems. Hull-related equipment includes ballasting and trim, drain and bilge systems including emergency drain, HVAC, and utility systems. A typical hull has four columns, ranging in size up to 100 ft in diameter, and connected at the base by four rectangular pontoons. The pontoons are flooded during inshore construction, module mating, and TLP installation. Deballasting is done through pumps located in the caissons. During normal operations, the pontoons are dry. Construction of the hull takes place in drydock. Module support beams are constructed with the hull. Constructed sections are floated to an inshore site for assembly, then towed to location. An example of an installation of the surface facility and hull for a recent Gulf of Mexico TLP is summarized. The hull was built in Taranto, Italy, and dry-transported approximately 6,500 nautical miles to Corpus Christi, Texas, using the Mighty Servant 2, a heavy load vessel. Dry transporting took 22 days, compared to 92 days if it were wet towed. Hull and deck modules were integrated at Ingleside, Texas. A shore-based specialized lifting device (SLD) was used to place the modules on the hull. The SLD is a one-of-a-kind, land-based, twin boom-lifting device built for this purpose. Its lifting capacity is 4,000 short tons. Each lift involved positioning the hull so that the module package barge could be positioned under the SLD to connect the lift rigging. The package was lifted 150 ft in the air (this took about 3 hours), and the hull was positioned under the package and secured. The module weight was transferred to the hull. Each lift operation took 8 to 12 hours. The platform was then transported to the site using four ocean-going tugboats, traveling at three miles per hour, taking seven days for the 400-mile transport. Because the installation took place inshore there was no need for extra helicopters, supply boats, and marine equipment, and offshore operations, quartering, and weather delays were greatly reduced. Peak manpower used during installation was 350 people. Well drilling for the TLP often begins after well template installation. A TLP can have 50 well slots with provisions for satellite subsea well tiebacks. Predrilling involves using a mobile offshore drilling unit (drillship or semisubmersible) to batch drill and case the wells to a convenient depth, normally through the shallow water flow zone or other potential hazard. Predrilling may also be suspended just above the production zone. Some wells may be drilled to total depth and completed. The Sonat George Richardson semisubmersible drilling vessel is an example of the type of vessel used to predrill.